As anyone who has ever kept sheep will lose no opportunity to tell you, sheep are the Houdinis of the animal world. They are escape artists par excellence. This field has had a new gate and new fencing installed recently. We’ll see how long it takes them to find their way out. Once the sheep realise that the all the tasty stuff is actually in the field with them, however, they knuckle down and focus on the job of keeping the grass clipped as short as possible. But this realisation dawns slowly. For the first few months, especially, the lure of the wild blue yonder is too strong to be denied, or may be it’s just that the grass has to be greener on the other side of the fence, they’ve read it on Facebook – it had twenty thousand ‘Likes’ – so it must be true. Driving around at this time of year becomes increasingly hazardous as the lambs become more adventuresome and bolder. Some have taken the trouble to plan their escape route ahead of an emergency, others haven’t. When you drive down the lane, those on ‘Red Alert’ immediately take evasive action and head straight for the hole in the hedge they made on their way out of the field. Those happy-go-lucky types, for whom forward planning is an anathema, scuttle up and down the verge or run along the road in front of the car. Many times I have had to wind the car window down and lecture a bunch who belie Bo Peep’s belief. Leave them alone and they’ll come home, indeed! Oh my goodness, the little lambs are so adorable! (Though the lamb and mom staring at the camera do look like they might be plotting something.) So David, when you lecture the lambs, do you speak in their language or yours? 😀 And speaking of spring, seems it’s finally arrived here! Sunshine and balmy temperatures today. 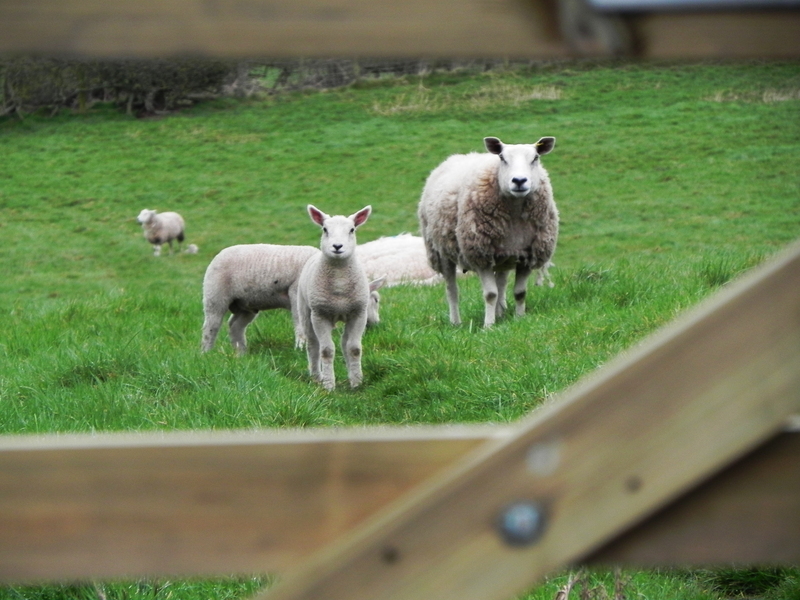 While the local dialect can be quite expressive – particularly in times of stress – We have sheep from all over the place come here for the nice green grass. So I generally try to stick to standard English. Thank goodness for a nice sunny day! We are having things a bit mixed at the moment – I think when they are busy ‘up there’ they just put us on ‘Random’ for a bit – so they can get on.